As Mrs Reed could not afford that, she phoned around and we arrived. We checked both doors out and found that the only fault was that one of the doors had dropped out of alignment. We advised Mrs Reed that one of the cylinders was also faulty but this was not the reason that she could not lock the door. We adjusted the door and replaced one cylinder saving Mrs Reed at least £230.00 minimum if she had said yes to the other company. Absolutely, first class service from start to finish! Saved me a fortune. Really professional, it was obvious he knew what he was talking about. I would recommend Owl Locksmiths and Security to anyone. 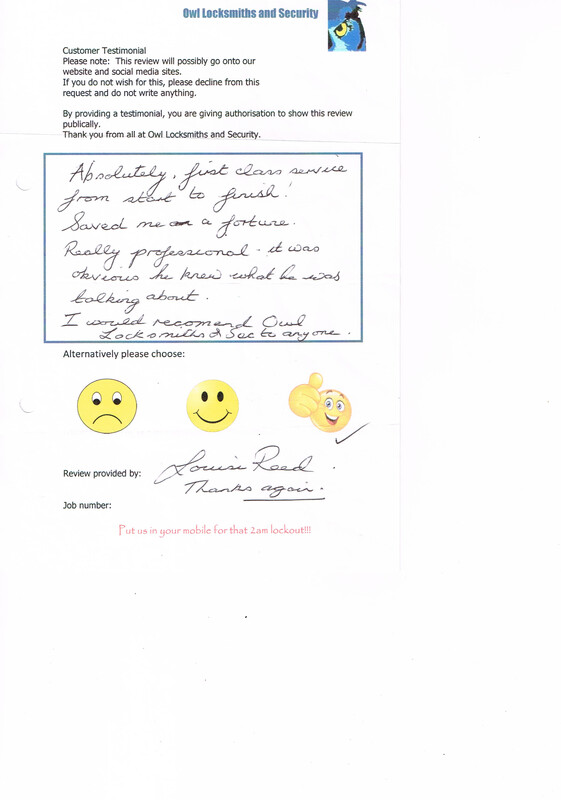 Glad we could assist you Louise. Thank you for a truly great recommendation.